When writer’s block hits and I feel like my life lacks imagination and originality, I often mumble, “I’m just not a creative person.” I would think of creativity as something geniuses are born with. But Allen Gannett would beg to differ. Allen is CEO and founder of TrackMaven and author of The Creative Curve, due out June 12. In his book, Allen shares insights into creativity, including research supporting the idea of “natural-born talent” as a myth. 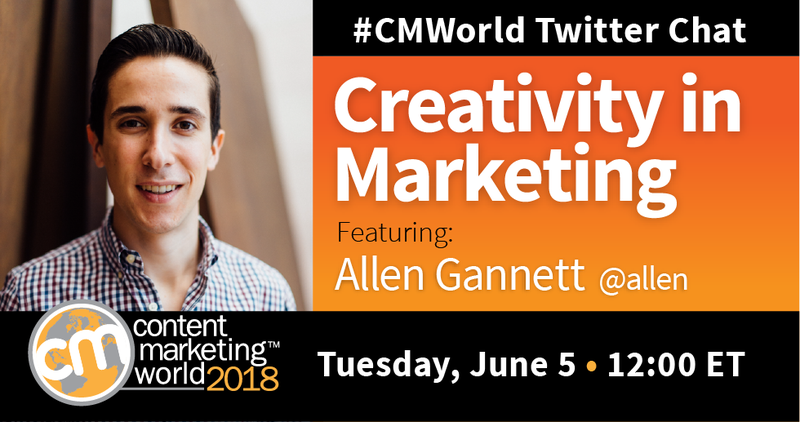 During a recent #CMWorld Twitter chat, Allen challenged us to think differently about creativity. Below are highlights of that chat. In what ways can you train yourself to be more creative? Are there methods or exercises that can be done? How can you learn to be OK being a little uncomfortable? Some may argue certain industries or jobs don’t require or allow for creativity. Or that particular organizations don’t encourage it. How can we shift this mindset? Want to learn more about creativity and how to cultivate? Check out our Twitter Moment. Craving more? Grab a copy of Allen’s book, The Creative Curve. To be inspired and get more practical insight, attend Content Marketing World 2018. Industry leaders like Allen will be there, and we hope you will be too. Sign up now with code SM100 and get $100 off at checkout.